The CN Tower is closed after large chunks of ice fell from the downtown Toronto landmark on Monday, causing damage to the Rogers Centre below and cancelling tonight’s Toronto Blue Jays game. The falling ice is a result of rising temperatures in the GTA following an unusual bout of winter-like weather over the weekend. They said falling ice happens “from time to time” and that they’re working with Toronto police to ensure the safety of pedestrians. On Monday evening, Toronto police said the closure around the landmark is expected to last until Tuesday morning after engineers assess and deem the area safe of any potential hazards. According to the Rogers Centre, some of the ice falling from the CN Tower tore through the roof of the building and caused water to leak onto the field. Officials decided to cancel Monday night’s Blue Jays game against the Kansas City Royals has been due to the damage. The team will play a doubleheader on Tuesday. A construction worker at a nearby high-rise says the ice falling from the CN Tower has also smashed windows at the building. No injuries have been reported in either incident. Toronto police officers are monitoring the situation and have closed the entrances to both the Rogers Centre and the CN Tower. The landmark is one of many weather-related incidents causing tricky and possibly dangerous conditions for Torontonians today. Thousands are still without power after high winds and freezing rain hit Toronto and much of southern Ontario on Sunday. As of 5 p.m. Toronto Hydro said about 1,500 customers scattered throughout the city were still without power, down from 10,000 this morning. At the height of the storm, about 44,000 customers were impacted by the outage. Toronto Hydro spokesperson Tori Gass said crews have been working "non-stop" since the start of the storm. 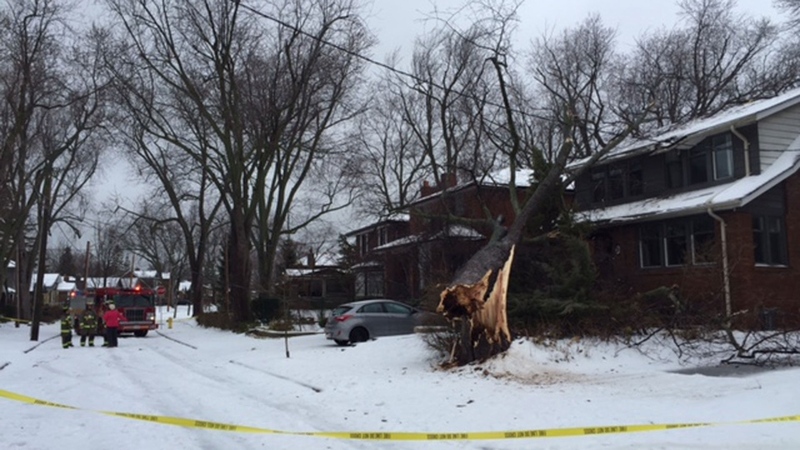 "The wind storm probably did more damage than the freezing rain and the ice," she told CP24. "We won’t stop until all of the power is back." She said rain and high winds have hampered restoration efforts. "It is going to be a little bit tricky (with) difficult conditions out there," she added. As of late Monday afternoon, Provincial utility Hydro One said about 97,000 of its customers are still in the dark. "We already restored power to 123,000 customers since Saturday. So really if you are looking at the magnitude of the storm, nearly 200,000 of our customers have been impacted," Jay Armitage, a spokesperson for Hydro One, told CP24 Monday. "We are not out of the woods yet. We do imagine that more and more customers will continue to be impacted throughout the day." She said Hydro One is not able to provide a clear timeline as to when all customers will be back online. "As we see the storm pass and as day break comes this morning, we are going to have 1400 power line workers, forestry workers out in southwestern Ontario and central Ontario helping to get the power on as quickly as possible," she said. Rainfall and wind warnings previously issued for the city and surrounding areas have ended. Environment Canada said the region can expect approximately 20 to 30 millimetres of rainfall until the system tapers off late Monday. Strong winds reached up to 100km/h in some areas of the GTA overnight, downing trees, power lines and hydro poles. Toronto police said they have received multiple reports of downed hydro wires around the city and downed hydro poles have closed Victoria Park Avenue from Steeles Avenue to Gordon Park Road. Power issues and icy conditions caused a waterfall of delays and suspensions on the TTC early Monday morning. The Scarborough RT, which was suspended due to ice-covered rails on Sunday, resumed shortly before 7:30 a.m. Monday, though not without causing commuter congestion and confusion at some stations. For those who rely on GO Transit, Metrolinx spokesperson Anne Marie Aikins says the agency's tracking system has been affected by a power outage, which is preventing them from providing up-to-date travel times and delays on their website. She urged anyone looking for an update about their GO Transit route to check the agency’s Twitter account. Due to an issue unrelated to weather, travellers utilizing the Milton line should expect “very long” delays, she added. Canada Post also issued a “Yellow Service Alert” for the GTA, which warned customers of possible delivery delays. Ponding and pooling has been reported on roadways across the city and the weather has prompted school boards across the GTA to cancel buses and close schools this morning. As temperatures rise to a high of 5 C, Environment Canada says melted ice could cause “potentially hazardous” driving conditions on some roadways and highways. Toronto police had tweeted about a number of weather-related road incidents by Monday morning including downed wires, pooling and malfunctioning traffic signals. They urged drivers to clear snow and ice off their vehicles before heading out to avoid dangerous situations. The erratic weather conditions have left hundreds of passengers stranded at Pearson Airport, with more than 600 flights cancelled over the weekend and many others plagued with lengthy delays. Exhausted passengers slept in rows on the ground at Terminal 1 on Monday morning while others curled up under their jackets on chairs. Some frustrated passengers say they spent hours on planes after landing at the busy airport. “When we arrived here at Toronto Pearson it was 12:30 and we were on the plane for almost five hours, sitting there on the tarmac,” one traveller told CTV News Toronto. When the frustrated passengers were finally allowed back into the terminal, they had to search for their belongings through piles of luggage. “We went to get our luggage and none of the carousels were moving,” another traveller said. In some instances, passengers were told their baggage was not coming off the plane at all. Georgetown resident Shawn McLeod said he was supposed to be in Cuba, but decided to head home after a long wait at the airport. McLeod told CTV News Toronto that he was not notified by Sunwing of the flight delay prior to arriving at the airport. Sunwing said they will also be offering refunds for passengers who have waited over 12 hours for their flight. The airport warned passengers heading there today that they should expect busier than usual operations at the due to the weather. Travellers are advised to check their flight status ahead of time as delays and cancellations continue to be reported. Toronto Maple Leafs fans hoping to cheer on the team from Maple Leafs Square tonight in Game 3 against the Boston Bruins will have to make alternative plans. The ongoing wet weather conditions has prompted the MLSE to cancel the tailgate party. “Conditions will continue to be monitored over the next 24 hours to determine the status of the fan tailgate parties in Maple Leaf Square for events scheduled tomorrow (Raptors vs. Wizards) and Thursday (Maple Leafs vs. Bruins),” the MLSE wrote in a new release. The Toronto Zoo also remains closed today due to the severe weather conditions. They are expected to reopen on Tuesday.